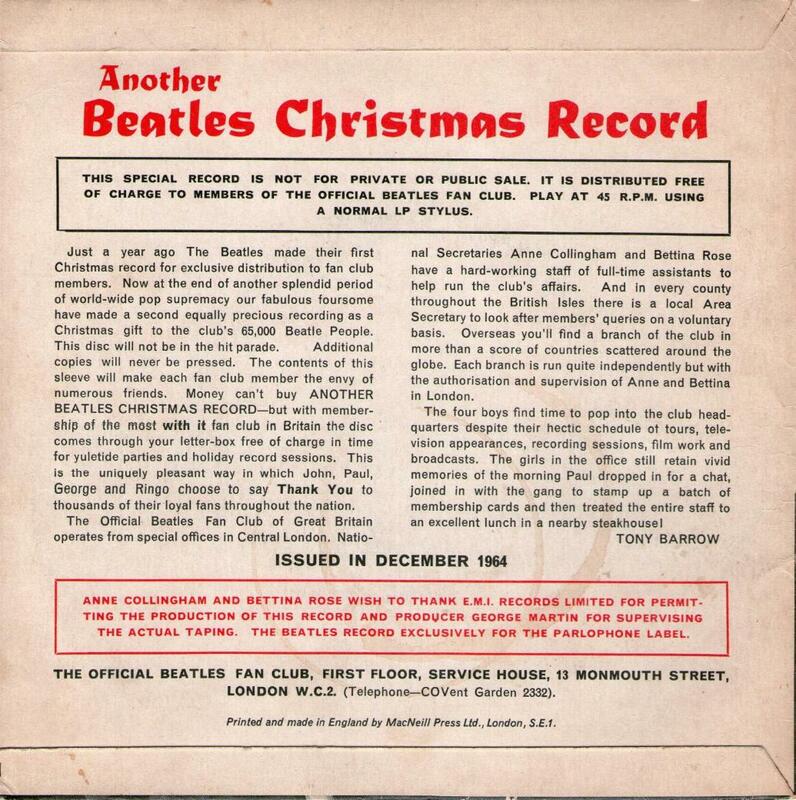 The Beatles Collection » Another Beatles Christmas Record, Lyntone LYN 757. 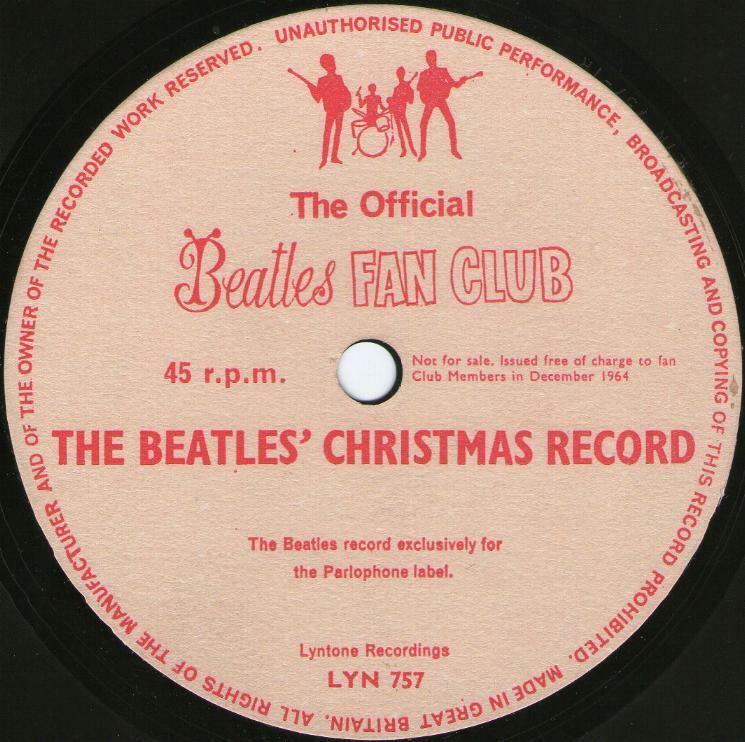 Another Beatles Christmas Record, Lyntone LYN 757. 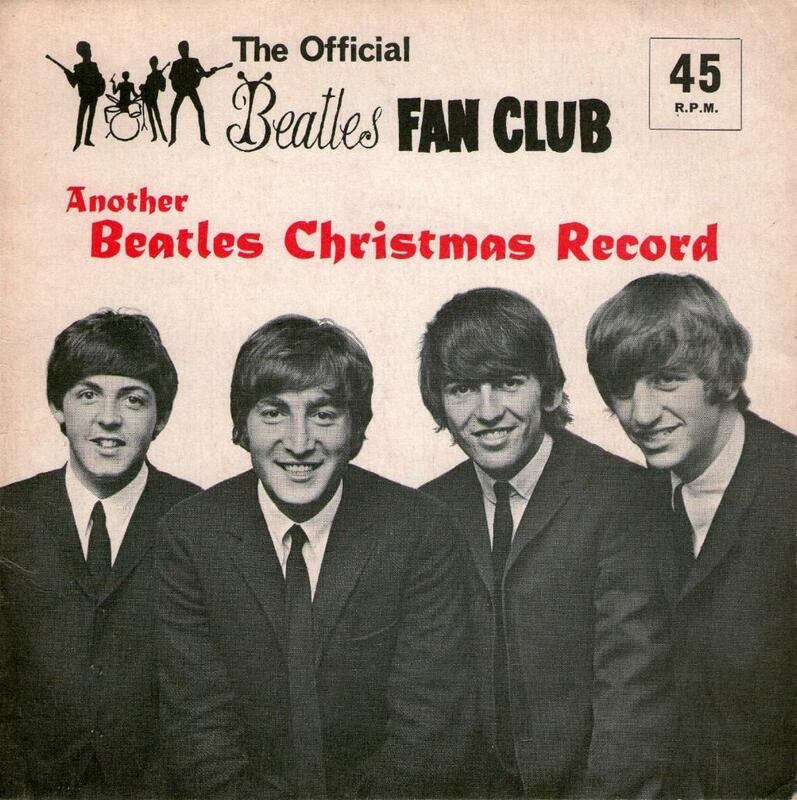 The second Beatles Christmas record was issued by Official Beatles Fan Club in December 18, 1964. The song “Jingle Bells” is sung, followed by individual messages to the fans. John mocks the prepared statement, doing an imitation of Paul Harvey and includes his own pseudo-words and ad-libbing. When Paul asks him if he wrote this himself, he says, “No it’s somebody’s bad hand-wroter. It’s been a busy year Beople peadles, one way and another, but it’s been a great year too. You fans have seen to that. Page two… Thanks a lot folks and a happy-er Christmas and a Merry Grew Year. 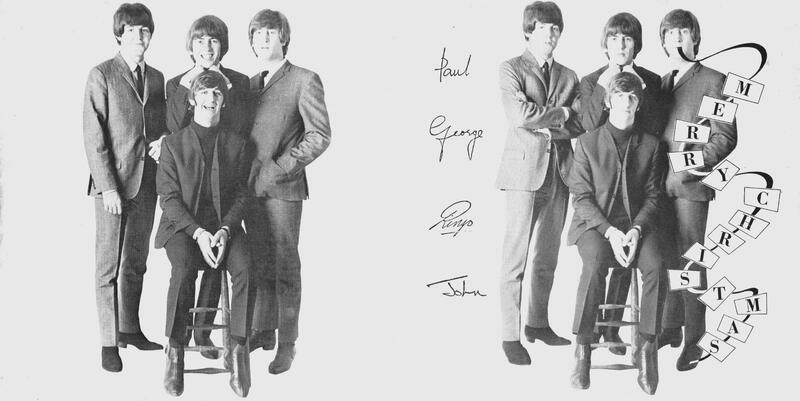 Crimble maybe.” (The statement is apparently handwritten as at various points in the recording, Paul reads “making them” as “melting them” before correcting himself and George reads “quite a time” as “quiet time” before correcting himself with “great time” as well.) Finishing up the record is a brief rendition of the traditional song “Oh Can You Wash Your Father’s Shirt?”. The disc was packaged in cardboard sleeve printed and made by MacNeil Press Ltd., London. The back side has text by Tony Barrow, who wrote the liner notes to many of the band’s early albums and EP records. 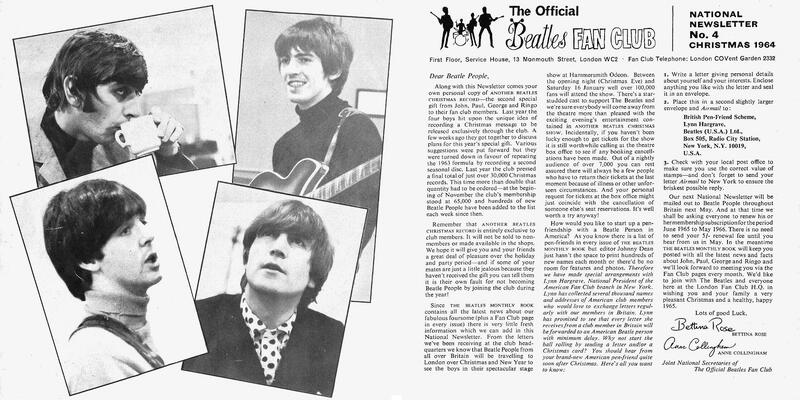 The Fan Club’s National Newsletter No. 4 included with the holiday mailing. The one-sided disc has white labels with red text. 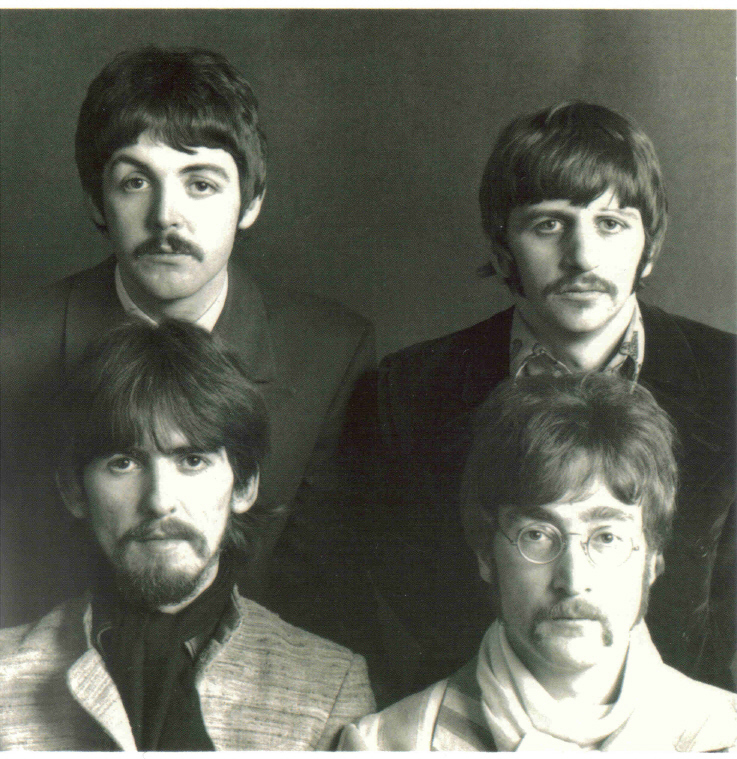 While the 1963 disc plays at 33 1/3 – rpm, the shorter 1964 record plays at 45-rpm. Total time: 3:58. Lyntone Recordings pressed approximately 65,000 copies of 1964 Christmas record. Matrix number LYN 757-1R.